ART for the Masses, ART for the People. : Ali The Greatest 2. Nov 2015, GSA,HS, For JEHOVAH 14. by Glasgow Cowboy: Current and Past Work Jan 2008 onwards. Ali The Greatest 2. Nov 2015, GSA,HS, For JEHOVAH 14. 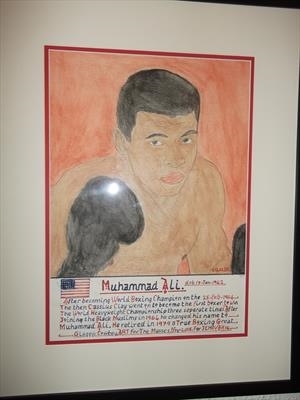 A water colour painting with calligraphy of the Greatest Muhammad Ali, his passing was a great loss to mankind but he is now young again and with Allah. ART For The Masses ART For The People.